Want to change or assign or remove Hard Disk drive letter? You can use Windows Disk management or Diskpart to tweak this. When your first add or install a drive on your PC than it automatically a a drive letter. Every drive on your PC have a letter assigned to it whether it is removable disk, floppy disks or your hard disk drive. There are plenty of ways to change the assigned letter with your own. But you can't have two drives with same letter. You can achieve this by using Command Prompt or by using Windows Disk management feature. I will suggest you to go on with Disk management tool which will give you little easy to use graphical user interface (GUI). 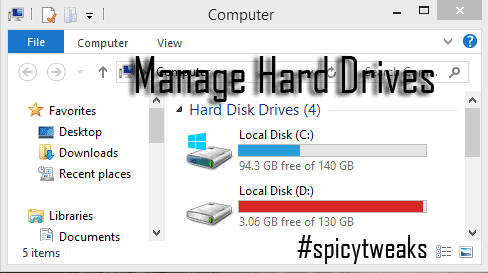 In this post I will show you a trick which will allow you to fully hide a Hard Disk Drive (HDD) partitions which will hide the drive from your PC users or even from you. I will also tell you an easy way to change or assign letters to your drive. So, Are you ready? Read the post. Right click on Computer and than click manage. When the Disk management dialog box opens, double click on Storage. Now open Disk management. 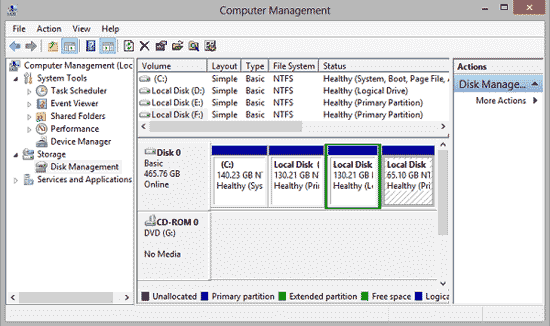 Double click on Disk management (type: snap-in) to open the disk manager. When the Virtual Disk manager opens, look for the drive you want to assign, change or remove the letter and follow the steps shown below very carefully. Right click on the drive and than click on Change Drive Letter and paths. Click on Change button in the next dialog box that appears. Now choose a letter and click OK.
Look for the drive on Windows Explorer. Its letter should have been changed now. Note: You can't have same letter on two drive. If you want to assign letter of an existing drive to your new partition than first change the letter of that drive instead. Now you'll be able to assign that letter to your partition. You might want to Improve Hard Drive Performance. Go to the given link to know more. Do you have anything on your drive which you don't want to show to anyone? If yes, than you can completely hide that from everyone (even from you). We will remove drive letter to hide the particular partition or hard drive. You'll not lose anything and every file will be kept secure (inside the hidden drive). Follow the steps explained below to hide your Hard Drive Partition easily. Right click on the drive which you want to hide. Click on Change Drive Letter and Paths from the right click menu. Click on remove button when the dialog box appears. You will receive warning that the program that relies on this drive will not work. That's it! The drive will be hidden now. Want to make the hidden drive visible? It's a piece of cake. Open the Disk management as explained above. 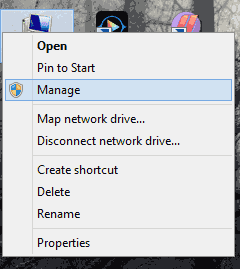 Right click on hidden drive and select "Change drive letter and paths". Click on Add button in the next dialog box. You can now assign a letter to the hidden drive. Finished. You can view the drive on Explorer now. You can now change, assign and remove hard drive or removable drive letters using this tutorial. You can also do this using Diskpart utility using the command prompt but it will be better to use Graphical interface to do these tasks.